Let your kids come home from school and instead of finding their usual snack, surprise them with something new. Something have never seen before or rather tasted. 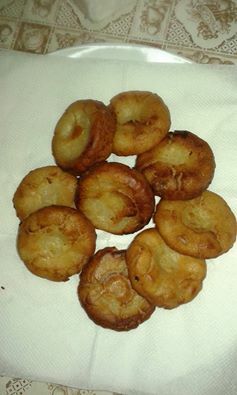 Here is the simple and easy kaimati recipe. In a small bowl, take 1/2 tsp yeast , 1 tsp sugar mix with 3 table spoon water cover and let the yeast process for at least 5 min. Mix all the ingredients plus the processed yeast in a big bowl to obtain a thick paste. Cover with a warm kitchen towel n give it 20-30 minutes to process. Since I don't have the special "vitumbua" pan, I use a muffins nonstick baking tin. Put some oil in the tin this is to avoid the 'batter' sticking on your pan. Fill the spaces on your muffins' baking tin up to 3/4 of the tin. 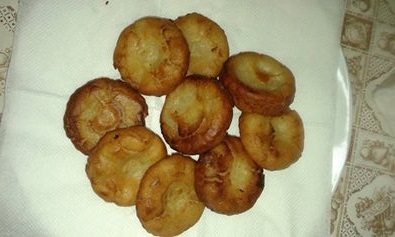 You can even deep fry like kaimati but have in mind that you are using rice flour and it absorbs too much oil.